Released one year after Half-Life in October 1999, Opposing Force takes you to the vantage point of one of the soldiers sent in to cleanse Black Mesa after the resonance cascade disaster. When your chopper is shot down, you end up in the same boat as the scientists in Black Mesa, trying desperately to survive. Shephard gets to use a variety of different weapons compared to the ones Gordon used, like a giant wrench instead of a crowbar. Best Easy difficulty time: Single-segment 0:29:06 by Albin 'quadrazid' Sigby on 2011-11-10. Best Boot Camp time: Single-segment 0:09:34 by Paul 'PJC' Connolly on 2014-04-05. Single-segment Easy0:29:06 by Albin Sigby. First I'd like to thank Spider-Waffle for his segmented run of OF and his other contributions to HL in general. coolkid and rayvex for all playing and speedrunning together. This speedrun was made with Opposing Force 1.1.0.4 which still got uncapped bunny hop and solid tripmines. And therefore the best version to make a speedrun with. The first four seconds is supposed to be a black fade-in effect. But this is not recorded in the demo. Then its some bhop to the Kevlar to make Barney open the following door. I need to take it easy with the laser beams, its instant death if I would touch one. After the small tunnel I use a slope to surf down and gain some speed for coming bhop. I'm able to use the switch through the fence, saving 20s. When I'm about the go to lower regions, I accidentally jump off the ladder taking some unnecessary falldamage. After I grabbed the shotgun I used an acute angle in the corner to prevent falldamage. Starts off with a pretty long tramride. Then some other pretty long sequences. Messed up the bhop and was damn close to fall down the ceiling. Before the fans I walked a bit forward to trigger an autosave which cause a slight lag. And I dont want any lag while executing the risky jumps by the prompt death fans of doom. After the explosive area I tried to take advantage of a downwards slopejump. But failed to do so, took some unnecessary falldamage. I'm really satisfied with the part after I passed the elevator shaft. I managed perfect vent wallstrafe jumping. Then I cleared the barrier quickly and also the following jump into the second vent. This jump is way harder than I made it look. I start this chapter with some friendly fire. Double shotgun blast in the blowtorch guys face. Because he got a neat weapon. I avoid some slave zaps by putting some handgrenades. But I also take some intentional damage to get down to 20-30 armor for the upcoming grenadejump, saving about 25s. I kill the houndeyes since they else tend to distract the medic later on. When I reach the surface I put a nade behind the medic to reposition him and also skip a speech of his. Take out the ninjas and bring the medic to the next blowtorchguy. The medic is mostly loyal and follows nicely, but not this time for some reason. When the other dude is torching, I have time to collect some stuff underneath. Next part after I picked the M249 machinegun is very hard even on easy difficulty. But I made some well placed grenades and got away with 60hp which is very good. Bhop down to the tollgate and make a small slopejump to reach the button to open up the next rail. Here I use the recoil from m249 to get some nice speed going. Really satisfied with the rail bhop which lasted almost all way. I visit the borderworld and get myself a cool portal displacer weapon. During the fade-in its easy to open the elevator doors. Then I pulled of the ladderfall pretty nice. I later use the scientist a bit before he reached his waypoint, that way he won't start his speech. After he opened up the door, I messed up with the Pit Drone monsters some, they're pretty annoying. After the long teleport sequence, I must open up a hatch under the water to proceed, includes some nice ladder tricking. Most risky timesaver in the run. Saving over 2 minutes. Dropping down and squeeze myself in an acute corner. Then get to the other side of the room to enter correct displacment triggerzone. Now when I get back from the xen sublevel, I will spawn inside the vent. Normally you would have to go a very long and slow detour to pick up a grappleweapon in order to get up into the vent system. While I was in the sublevel I was a bit clumsy and almost died when I missed the teleporter in the fall. But there is plenty of health coming up so I didn't lose that many seconds. I have time to collect some HP/AP during the timescripted sequence. Then the Pit Worm is really easy to bypass, saving a minute or two. Since I skipped the grappleweapon, I have to use snarkboosting to reach the surface. After some bhopping I take a small detour to collect 40 cells for my portal device. Making another displacement trick. Skipping a maze of annoying and deadly Voltigores, saves about 20s. Then I once again pick up some cells for the next displacement trick I do after the underground bhop. Makes me spawn on the other side of the hatch, saving 12s. I take advantage of a pushtrigger out the broken grill, then some pretty speedy recoilboosted bhop. Then a snark to boost over the wall. Once I reach the helicopter area, I take cover so it wont crash close to me. The crash explosion deals a lot of damage. On the rooftops I use a small snark boost to get to the highest level. Saves me from deactivating the electricity. Here's a interesting thing. There is a flaw in the conveyor system, which let me slip past the boxes without waiting for it twice. Before I go down the final elevator to fight the boss, I fill up my armor for safety reasons. I put a tripmine below the ladder so I can climb it if I would fail a jump later on. I pretty much nailed the boss fight, fast eye shots every time. I only failed a bhop to the other side once, costing some seconds. 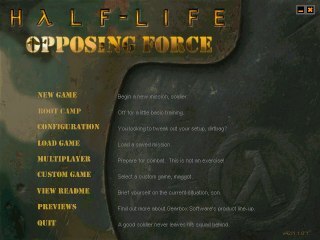 Thats it, Opposing Force single-segment in 29 minutes. It was a fun challenge to create, I hope you liked it. If anyone would like to try SS running on the WON version of HL. This is what I got in my game.cfg which is automatically executed by the game each loading. Set "alias autorec s4v3" and start c1a0, of1a1 or whatever. alias s4v3 "stop;host_framerate 0.00000001;sensitivity 0;w50;alias autorec l04d;save temp;load temp"
alias l04d "w50;demorecord;host_framerate 0;sensitivity 2.5;alias autorec s4v3"
Single-segment Boot Camp: 0:09:34 by Paul Connolly. but when bhopping without, it is very hard to have perfect timing, so you'll notice the extra footsteps in between jumps. enabling me to walk freely throughout the fade-in without resetting/loading mid-run. tricks/exploits available in comparison, but it's still fun to bunnyhop through obstacles and annoy the instructors, lol.